Two families reunite for a feast on Eid ul-Fitr, the day Muslims celebrate the end of the month of fasting. 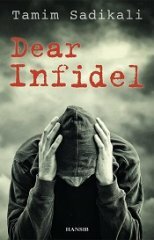 This is a story about love, hate, longing and sexual dysfunction, all sifted through the war on terror. Tamim Sadikali was born in Sidcup, Kent. He read Mathematics at Warwick University before entering the wonderful world of software. By day he kids himself that he cares about computing, and by night he writes - usually something caustic. This, his first novel, is the result.